I am a foundation hoarder and I like my foundation to apply flawlessly and to it's best potential. These are my top 3 make up base applicators that has worked for me for different foundations, They are all extremely affordable and easy to get a hold of online. Let's start with the sponge, I do have the classic Beauty Blender Sponge, the Make Up Revolution Pro Blend Sponge (in a set) I've tried the Real Techniques Miracle Complexion Sponge, the Spectrum Collection's Unicorn Tears Wonder Sponge and own brand makeup sponge such as H&M. The one that stood out to me is the Makeup Revolution Pro Blend. Since I started using this, I have neglected my classic Beauty Blender (let me tell you - I have back up's of these in my draw), when you compare the MUR sponge and BB together, the MUR is much more smoother to touch, does not stain, is extremely easy to wash, does not break apart because of your nails (I have soo many nail rips in the BB sponge) and does exactly the same job for the fraction of the price, Do I love this? Absolutley. Do I need to try out any-more makeup Sponges? No, I've found the one for me. I use the MUR sponge with all kinds of foundation, concealers and even powders to create a flawless finish and it has not disappointed me once. If your looking for an alternative to the Beauty Blender have a look at the Makeup Revolution range. Next up, the Spectrum Collections Flat Top Buffer B01 - £8.99. If you are looking to get the best coverage possible out of your foundation - the flat top buffer is the best. The bristles on the brush are densely packed therefore the foundation sits on top of the bristles. When I apply the foundation, I use a tapping motion and tap this into my skin distributing the product where I need more coverage and then buff it out to blend the rest of the face. 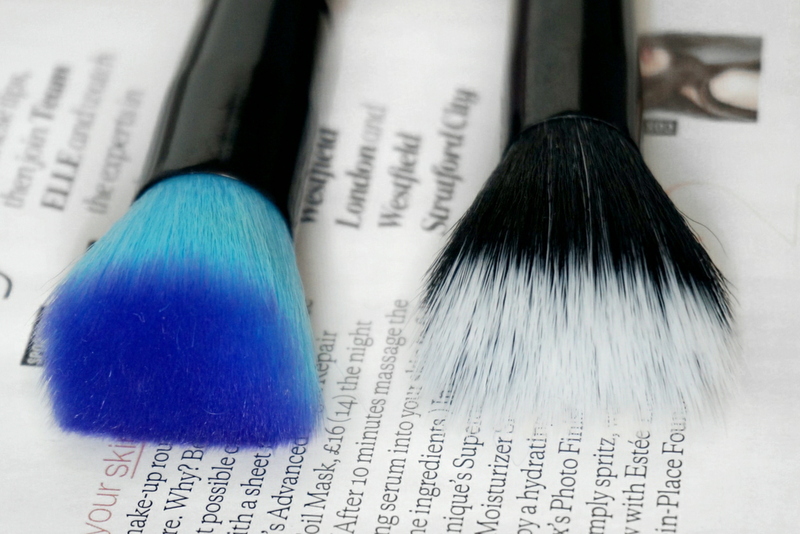 The brush helps create a flawless finish and does not leave little lines all over your face. Not to mention how physically appealing the whole collection looks. Cleaning wise, this is a little more difficult to clean as you have soo many bristles but if you have a brush egg (from Ebay) and a brush cleanser ( currently still using the Barbara Hoffman Solid Brush Cleanser) it takes seconds to clean. The whole Spectrum Collection is really soft and gently to the skin and I love using this with the Milani 2 in 1 Perfect + Conceal foundation. Lastly it is the ELF Stippling brush - £4.50. It is a duo fibre brush, which helps to create a airbushed look, it is very lightweight, easy to clean and easy to manoeuvre. This does not leave fine lines across my face and is one of the fastest applicator to distribute the product. I love using this with the EX1 Iniviswear Liquid Foundation. This skin on skin finish with the stippling brush is a perfect match for flawless skin. I have had problems with the barrel being detached but I just stick it back together with super-glue and I haven't had a problem since. I own 3 of these brushes, which tells you how much I like it. 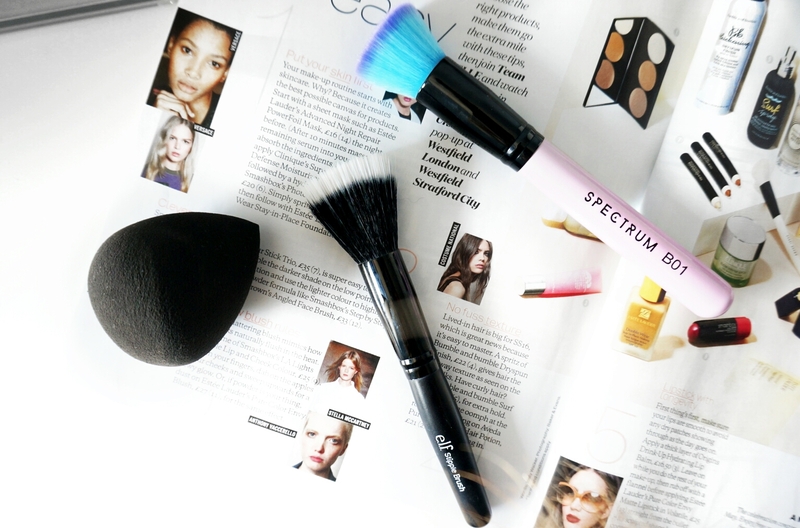 These are my top 3 make up base applicators, what's your favourite tool to apply foundation? I enjoyed your makeup post and for me I can't wait to get that Spectrum brush that I saw in the UK and Ipsy beauty boxes/bags!